Australia has many documented barriers to achieving gender parity in the workplace, and while a statistical overview of the pay and superannuation gap, differences in part-time and full-time positions held, and/or the percent of women in senior management or board positions is a good dashboard indicator, the most revealing view is to examine how things sit for women who face multiple barriers to achieving workplace equity. In today’s importance analysis, Catherine Hemingway (@cathemingway) of WEstjustice (@WesternCLC) shares findings from her Not Just Work report, which explores the high levels of discriminatory actions that recently-arrived women experience in their work places. Earlier this year, our legal service met Sanda. Sanda was 20 weeks pregnant and a newly arrived refugee. She worked hard in a manufacturing job, always receiving positive feedback. The day Sanda’s boss discovered she was pregnant, she was sacked. When we met her, Sanda was struggling to pay rent and buy food. She was owed thousands of dollars in unpaid overtime and below-award wages. Despite having a strong claim, Sanda felt afraid – she had experienced trauma in her home country, had little faith in legal systems, was afraid of her boss, focused on her pregnancy and providing for her family, and was experiencing community and family pressure to just let it go. Sanda decided not to pursue a claim. Employment is widely recognised as a vital step for successful settlement and social inclusion. Yet as documented in our Not Just Work report, exploitation is widespread in Australian workplaces. Despite some recent reforms, discrimination at work remains pervasive, at significant cost to health, productivity and justice. 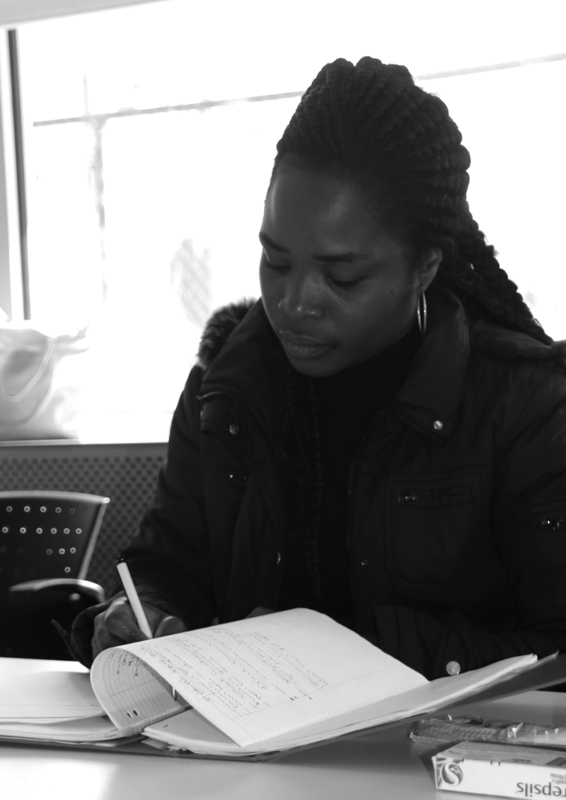 This article explores women’s experiences of discrimination at work, as seen through our employment law service (ELS) and education program for newly arrived and refugee workers. It is unreasonable to expect those who experience discrimination to be solely responsible for stopping it. We need legislative change, including a well-resourced Discrimination Ombudsman service to enforce key laws and promote systemic change. Women are more likely to be exploited and experience discrimination at work. WEstjustice has found that newly-arrived women are particularly vulnerable to experiences of workplace discrimination, but are also reluctant to identify or pursue such experiences using legal channels. Here, a WEstjustice community leader takes notes. Photo credit Jess Hogg (supplied). Through our casework and face-to-face education sessions at playgroups, sewing groups and other women’s gatherings, where we shared information about workplace rights and responsibilities,  we heard similar stories over and over: For example, a woman who had found work at a laundry, and told she did a great job and asked to come back early the next day. After telling her boss she could only come after dropping her child at school, she was told not to come back. Another woman, employed as a casual, was promised her job back after taking time off to have her second child, but was refused a position upon return. Many women never received a job interview until they anglicised their names, or who were warmly invited to an interview only to be told the position was already filled when she arrived wearing a hijab. Migrant women find themselves in an Australian labour market that has entrenched gender inequalities. They experience the existing pay gap between men and womenand discrimination when balancing caring or parental responsibilities, negotiating flexible working arrangements, and returning to work after pregnancy. Such exploitation is compounded by the cultural, literacy and practical barriers that prevent many migrant women accessing mainstream services for assistance. Although discrimination was commonly reported in consultations for our Preliminary Report and the women’s outreach project described above, this was not reflected in our casework service. Less than one in ten of our ELS clients requested or received advice on discrimination. Common problems seen at the ELS were largely similar between women and men, although a higher percentage of women had lost their jobs, and men were more likely to seek advice on workplace injury. Thirty-five per cent of female clients had an issue with wages or entitlements, 29% had been dismissed, 10% sought advice on bullying, and only 8% were advised on discrimination and/or general protections. The discrepancy between high occurrences and low enforcement rates of discrimination may be understood in reference to Sandra’s story. Clients may believe they cannot “prove” their case, or experience low awareness of Australian laws, fear of legal processes and authority, and/or the deep pain that reliving traumatic events can evoke. Many clients suffered significant psychological injuries as a result of discriminatory behaviour at work—and such injuries may have prevented others from seeking legal assistance. There are practical considerations to low enforcement; many of the women we encountered had recently given birth or were pregnant. One of our clients with a newborn cancelled her appointment – it was simply too difficult. We were in and out of Court at the time another client’s baby was due; the strength and courage that it takes to pursue a case in such circumstances is incredible. Clients also faced family and community pressure to discontinue claims. Capturing the stories of workplace discrimination is the first step. Here, a WEstjustice volunteer listens intently to a client’s experiences. Photo credit Jess Hogg (supplied). Sole reliance on individual enforcement is ineffective and unfair. Workers who experience discrimination have a range of legal options including making a complaint to the Victorian Equal Opportunity and Human Rights Commission (VEOHRC). Each approach requires the complainant to make a written application and follow their case through. There is no proactive regulator who can run a case on behalf of a client, or gather intelligence and prosecute an employer. Given the power imbalances and lack of enforcement, there are few incentives for employers to take positive steps to reduce discrimination. Current remedies do not address the problem of discrimination. Another key problem is that most claims settle for financial compensation without addressing the problem of discrimination itself. This enables businesses to “pay their way out” of claims without making any meaningful change. And so, discrimination remains an invisible problem, with no visible consequences and low awareness of rights. Because most claims settle confidentially, there are rarely visible consequences for unlawful discrimination. This means that individuals remain unaware of their rights at work. Success stories for those who stand up against discrimination are silenced. Employers are not deterred from unlawful behaviours because they are not aware of consequences for others who are caught doing the wrong thing. We need a Discrimination Ombudsman supported by community-based services. To stop discrimination at work, we urgently need to expand the powers and resources of VEOHRC and the AHRC, and introduce a Discrimination Ombudsman service. A well-resourced regulator with greater enforcement powers would ‘counter the deep pocket/repeat player advantage enjoyed by some respondents’. It could also promote systemic change within problem workplaces, undertake own-motion investigations and prosecutions, promote and seek systemic remedies including workplace training and compliance audits, celebrate best-practice employers, run powerful education campaigns, and champion the benefits of diverse workplaces free from exploitation. This role would also support sexual harassment workplace claims; in light of the Australian Human Rights Commission’s just-released report on the extremely low levels of reporting sexual harassment incidents, appointing such an ombudsman is well overdue. In the UK, US and some Canadian jurisdictions, the regulator can give advice and provide direct support to complainants. Just as the Fair Work Ombudsman in Australia can stand in the shoes of an applicant and prosecute a company directly, the VEOHRC and AHRC should have the power to assist clients with meritorious claims and run strategic litigation to promote compliance. Like the FWO, mediation and enforcement could be delivered by separate teams within the VEOHRC/AHRC. This is particularly appropriate as VEOHRC/AHRC has specific expertise in anti-discrimination conciliations. To complement the work of this more powerful regulator, vulnerable workers also require access to free legal help, as represented clients have better outcomes. It is essential that such services be made easily accessible for women. Legislative changes are also required, including a right to work flexibly (not just a right to request it! ), and addressing the challenge of “proving” discrimination by introducing a reverse onus of proof. This would require a worker to show they had a protected attribute (e.g., they are female) and were treated badly. The employer would then need to prove that the discrimination was not because of the attribute. This is fairer, as the employer has access to its own internal records and evidence about decision making, while the employee does not. In addition, existing laws should be amended to require courts and tribunals to award remedies that promote systemic change, expand existing reporting obligations to require companies to report publicly on diversity and anti-discrimination measures, and create incentives to increase diversity in workplaces. Through our work we have observed many endemic issues for women at work including non-payment of wages and superannuation, sexual harassment and exploitation in key industries, including care work and au pairs, cleaning and hospitality. WEstjustice would like to thank volunteer Gemma Saccasan for her assistance proof reading and editing this article. Catherine Hemingway, ‘Not Just Work: Ending the exploitation of refugee and migrant workers’, WEstjustice Employment Law Project Final Report, available at www.westjustice.org.au/publications/policy-reports-121, “Employment Law” tab. According to VicHealth, ‘[t]here is a strong relationship between exposure to discrimination and poor mental health’: VicHealth, ‘More than tolerance: Embracing Diversity for Health’, (Summary Report, 2007), 11-12. For discussion of intersection in relation to female migrant workers see Margaret L. Satterthwaite, “Crossing Borders, Claiming Rights: Using Human Rights Law to Empower Women Migrant Workers,’ (2005) 8(1) Yale Human Rights and Development Law Journal. Monica O’Dwyer and Stella Mulders, AMES Research and Policy Unit, ‘Finding satisfying work: The experiences of recent migrants with low level English’, 2015, 20. With financial support from the Victorian Women’s Trust, WEstjustice explored the working experiences of women from newly arrived and refugee communities. In addition to analysing client data from our legal service, we engaged with various women’s groups, including sewing groups, financial literacy classes and playgroups. At these meetings we shared information about workplace rights and responsibilities, and heard from women about their experiences at work. See also Workplace Gender Equality Agency, Australian Government, Gender pay gap statistics (March 2016). See also Australian Human Rights Commission, Supporting Working Parents: Pregnancy and Return to Work National Review (2014). See in particular chapters 3-5 in Catherine Hemingway, ‘Not Just Work: Ending the exploitation of refugee and migrant workers’, WEstjustice Employment Law Project Final Report, available at www.westjustice.org.au/publications/policy-reports-121, “Employment” tab. 47% of survey respondents reported that discrimination at work was common, somewhat common, or that they or someone they knew had experienced it: Catherine (Dow) Hemingway, ‘Employment is the Heart of Successful Settlement: Overview of Preliminary Findings’ (Preliminary Report, Footscray Community Legal Centre, February 2014), p. 8. According to VicHealth, ‘[t]here is a strong relationship between exposure to discrimination and poor mental health’: VicHealth, ‘More than tolerance: Embracing Diversity for Health’, (Summary Report, 2007), 11-12. See also Kamna Muddagouni & Aimee Cooper, Sexual harassment regulations still not working for Victorian women, Sydney Morning Herald, 27 June 2018. Other options include the Australian Human Rights Commission (AHRC), Victorian Civil and Administrative Tribunal (VCAT), or the Fair Work Commission. The Fair Work Ombudsman does have a general protections team, however it has only brought a small number of prosecutions. Victoria Legal Aid has an equality law program that provides invaluable assistance to vulnerable clients with discrimination claims – but still this places responsibility on an individual to bring a claim. The Victorian Equal Opportunity and Human Rights Commission has limited powers to investigate matters that are serious in nature, relating to a group of persons, and cannot reasonably be expected to be resolved by dispute resolution (section 127, Equal Opportunity Act 2010 (Vic). However, the powers of VEOHRC are significantly less than those of the Fair Work Ombudsman, which include promoting compliance with the Fair Work Act ‘including by providing education, assistance and advice to employees, employers…’, monitoring compliance, inquiring into and investigating ‘any act or practice that may be contrary’ to the FW Act, and commencing proceedings in Court to enforce the FW Act (section 682, FW Act). Beth Gaze and Rosemary Hunter: Access to justice for discrimination complainants: courts and legal representation (2009) 32 UNSW Law Journal 699, 699. According to the report, 85% of women have experienced sexual harassment in the workplace over the last 10 years, however only 17% made a formal complaint. Of these, nearly one in five experienced negative workplace consequences. AHRC (2018). Everyone’s business: Fourth national survey on sexual harassment in Australian workplaces. Sydney: AHRC. Similar to the general protections provisions of the Fair Work Act 2009 (Cth). Female clients at the ELS were predominantly engaged in childcare/aged care/community services/health care/education (39%), cleaning (22%), hospitality (14%) and food processing (8%) industries. This largely reflects broader patterns, where women migrant workers ‘tend to be concentrated in the services sector and are clustered in women-specific jobs—both skilled and unskilled (statistics from May 2014-October 2015). Women migrants can be found in skilled positions such as nurses, teachers and secretaries, and unskilled positions such as domestic workers, entertainers and hotel employees’: Margaret L Satterthwaite, Crossing Borders, Claiming Rights: Using Human Rights Law to Empower Women Migrant Workers (2005) 8(1) Yale Human Rights & Development Law Journal, 36-37.